Quinn spoke to us recently at a Sky Sports event (file photo). ALL IN ALL, Martin O’Neill, his coaching staff and the Irish players can look back on 2016 with a real sense of pride. Having already qualified for European championships by the time the New Year was rung in, the current group gave Ireland fans something to cheer about in France with progression to the knockout stages thanks to that famous victory over Italy in Lille. The 2018 World Cup campaign came around in September time and the feel-good factor was deflated slightly by performances in the opening games. Results weren’t the problem — a credible 2-2 draw away to Serbia was followed by wins over Georgia and Moldova — but the spark that had given us reason to be excited heading into the campaign appeared to be missing. Those within the camp disagreed, with O’Neill talking up Ireland’s opponents and James McClean suggesting the team had been subjected to unfair treatment by the media. But the best was yet to come from them and it was the spirited Derry winger who seized his opportunity to rifle home the winning goal in Vienna — the first over Austria in 53 years and first-ever away from home. It leaves the Boys in Green sitting pretty on top of Group D with ten point from four matches and there’s a genuine belief now that finishing as outright winners is an achievable goal. 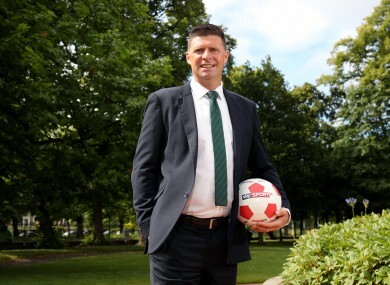 “In my kindest calculations as the group was starting off, I had not got Ireland in this position after this many games played,” former Ireland striker Niall Quinn told The42 recently. “So it’s testament to them and it’s been a fantastic effort up until now. “We got a little bit excited and were a bit hard on them after the Georgia performance at home but they got there and that’s what it’s all about. No one remembers how when you get to a tournament, they only remember the tournament itself. They have given themselves a good opportunity to almost seal the deal. That’s a fantastic place to be. “Wales have had a couple of hiccups, Austria are the same. Serbia look the main threat at this stage and I wouldn’t have thought that at the start. Quinn, these days a regular pundit on Sky Sports, says he has seen the group develop in the three years they have been under this current management team. “There was a steeliness and a maturity (in the win over Austria) after the success that they had at a tournament and, with the feel-good factor they must have around the dressing room, the next level was to be as resilient and resolute as they possibly could in that game,” he added. “Then to have the ability to take the openings that came as James did, and to snuff out what is a decent Austria side, showed a great maturity that proved the team has kicked on from the one that got to the Euros. “Qualifying for Euro 2016 was an easier thing to do as you could conceivably finish third and qualify, and now suddenly second place mightn’t even get you into a play-off. They’ve given themselves more than a fighting chance of doing that, which tells me that they are better. A meeting with Wales, who are four points back in third, at the Aviva Stadium on 24 March is what Ireland are now gearing towards. While the home side will be missing Robbie Brady through suspension, Welsh boss Chris Coleman could be without his talisman as an ankle injury has sidelined Gareth Bale for up to four months. Quinn accepts that the Real Madrid star would be an enormous loss, but warned Ireland not to get distracted by his race to be fit. “Of course he would be missed hugely,”said Quinn, who compared Bale to legendary Romanian footballer Gheorghe Hagi. “I’m a Gareth Bale fan and he has been awesome for them for a long time. What he does for his country reminds me of what Hagi used to do for Romania. He would run the show almost on his own and anything that sparkled was normally through him — he was either providing it or finishing it off. “That seems to be what Bale does nowadays for Wales. There’s (Aaron) Ramsey too of course, they will have him back and that’s good for them. Email “'In my kindest calculations, I hadn't got Ireland in this position. It's a fantastic place to be' ”. Feedback on “'In my kindest calculations, I hadn't got Ireland in this position. It's a fantastic place to be' ”.